Oklahoma Drunk Driving Statistics: 2014 DUI Report - McIntyre Law P.C. A charge of DUI, or Driving Under the Influence is very serious. Choosing to drive while under the influence has several lasting ramifications. For one thing, Oklahoma drunk driving is a significant cause of injuries and fatalities on the roads. Second, the law is not on your side — a DUI charge carries strong penalties. This is why McIntyre Law, P.C. keeps tabs on drunk driving statistics every year — it’s important to us to contribute to the safety and security of our community, and we want to make sure that you know the risks and the consequences. The statistics on drunk driving below are from the National Highway Traffic Safety Administration (NHTSA), Oklahoma Highway Safety Office (OHSO), Fatality Analysis Reporting System (FARS), and the U.S. Census. Check out the data below for updated trends and facts about DUI. 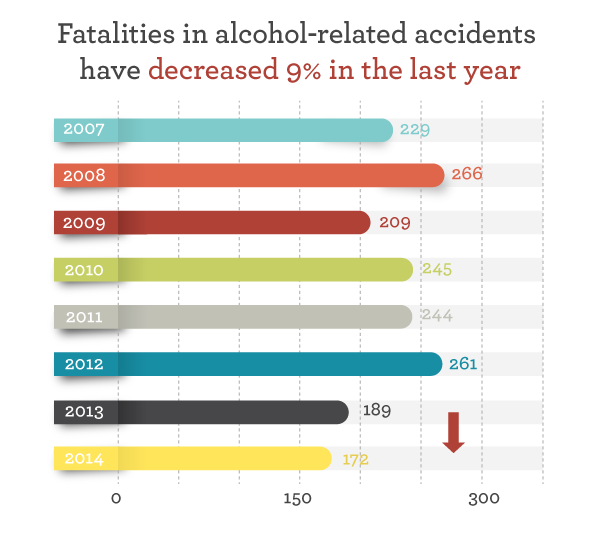 In the last year, the number of fatalities in alcohol-related accidents has decreased by nine percent. It has leveled off a bit from the previous year’s decrease of nearly 28 percent, but it’s still encouraging that the rate continues to decrease. In 2007, drunk driving statistics showed 229 fatalities in that year. That’s almost a 25 percent decline in eight years, but let’s take a closer look at how the statistics on drunk driving break out among different populations. Continuing the trend from last year in Oklahoma, drunk driving fatalities are more likely to be caused by males. 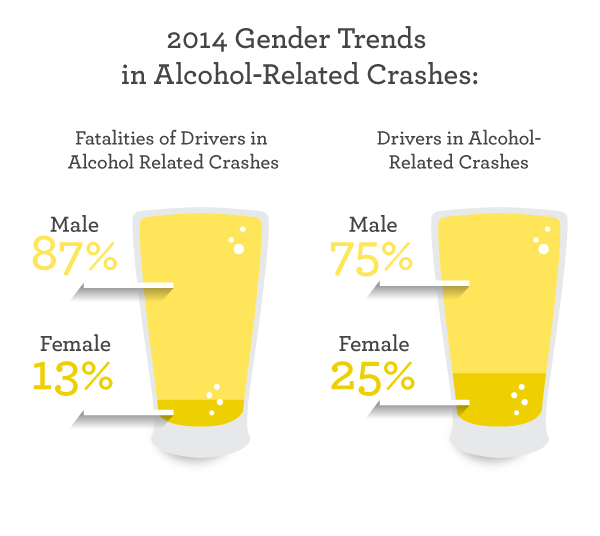 Male drivers were responsible for fatalities in 87 percent of alcohol-related crashes, while females made up 13 percent. However, the more interesting drunk driving statistics here are that even though they were responsible for fewer fatalities, women were still behind the wheel for 25 percent of alcohol-related crashes last year. What’s the takeaway from this? We can surmise that Oklahoma drunk driving is not a male- or female-related problem — both men and women are engaging in this unsafe behavior and more prevention is necessary in order to keep people off the roads when they’ve been drinking. Where do DUI accidents happen? Statistics on drunk driving show that accidents happen everywhere, under all kinds of conditions and circumstances. Between last year and this year, these figures didn’t change much. We’re still seeing that the most accidents happen on dark or unlit roads, but accidents on dark, lighted roads and daylight accidents are not far behind. 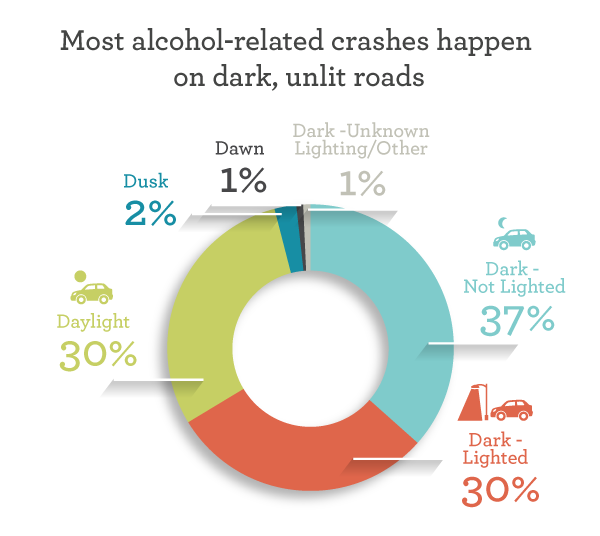 The fewest alcohol-related accidents occur at dawn and dusk. The harsh reality is that in Oklahoma, drunk driving continues to be a problem. Between 2006 and 2014, there were more than 76 fatalities each in Tulsa and Oklahoma counties. The counties with the next-highest concentrations of DUI fatalities are Cleveland and Comanche. The Oklahoma counties with the fewest DUI fatalities from 2006-2014 are Cimarron, Texas, Harper, Woods, Alfalfa, Harmon, Tilman, Cotton and Jefferson. Interestingly, the statistics for how many alcohol-related fatalities occurred in each county continue to change. Below, you can see which counties had the largest increases or decreases in the past two years. Notably, Cimarron, Dewey and Seminole counties all had increases of more than 20 fatalities. Craig, McClain, Johnston and Kiowa counties saw the biggest decrease in fatalities in recent years. Sometimes drunk driving statistics are strongly affected by the density in a certain area. Cimarron county saw the greatest number of fatalities relative to its population in recent years. Accidents happen, but DUI is preventable. In fact, lots of accidents happen because of things that could have been prevented — distracted driving and drowsy driving, especially by truckers — continue to be a problem. If you or a loved one were injured in an accident, McIntyre Law can help. Our lawyers have several decades of experience in personal injury lawsuits that include vehicle accidents. Regardless of where you live, work or travel, Oklahoma drunk driving continues to be a problem. However, each of us can do our part by staying sober on the roads, and making sure that our friends and family do, too. Don’t become a statistic — stay safe, and always have a designated driver in advance if you’re planning to drink. At McIntyre Law, it’s our mission to improve safety and protect the rights of Oklahoma car accident victims. We share these statistics in order to help raise awareness of this very important issue. If you or a loved one has been injured because of a drunk driving accident and you need the help of a personal injury lawyer, please contact us for a free, no-obligation consultation.